GUELPH, Ontario – The Upper Grand District School Board and its community partners are working to increase understanding and awareness around Fetal Alcohol Spectrum Disorder (FASD). FASD is a brain-based injury that can occur when an unborn baby is exposed to alcohol. FASD is a life-long disorder with effects that include physical, mental, behavioural and learning disabilities. These effects can vary from mild to severe. FASD occurs in all cultures and at all levels of society. Health Canada estimates that the disorder is present in nine in 1,000 live births. FASD is often referred to as an invisible disability. Due to the fact that we can’t see the disability, FASD is often misdiagnosed or misunderstood. Learning and behavioural challenges are often mistaken for other disorders. On International FASD Awareness Day, September 9, the Guelph FASD Family/Caregiver Support Group is hosting an event to start a conversation around FASD. The group hopes to build visibility and understanding for those affected by FASD. 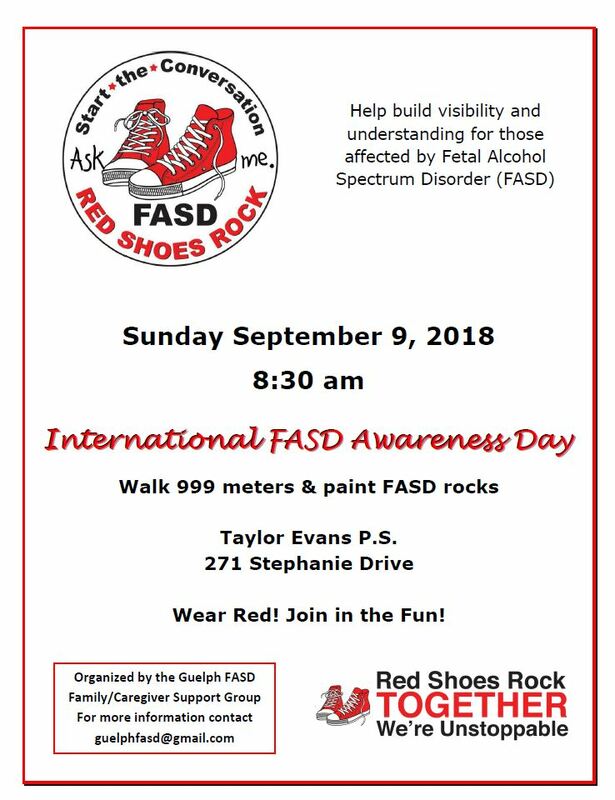 Join us on Sunday Sept. 9, 2018, at Taylor Evans Public School as we and our community partners work together to increase awareness around FASD. Wear red and join in on the fun! For more information on the Sept. 9 event, please contact guelphfasd@gmail.com. Parents/guardians interested in learning more about FASD are encouraged to visit the board website: Understanding Fetal Alcohol Spectrum Disorder (FASD) or www.ugdsb.ca/fasd.